Although spring has just arrived, flood waters have already carved a destructive path through Iowa and Nebraska communities, leaving many in recovery mode. While the road to community restoration can be long and hard, federal and state disaster relief programs provide an opportunity to expedite the process. 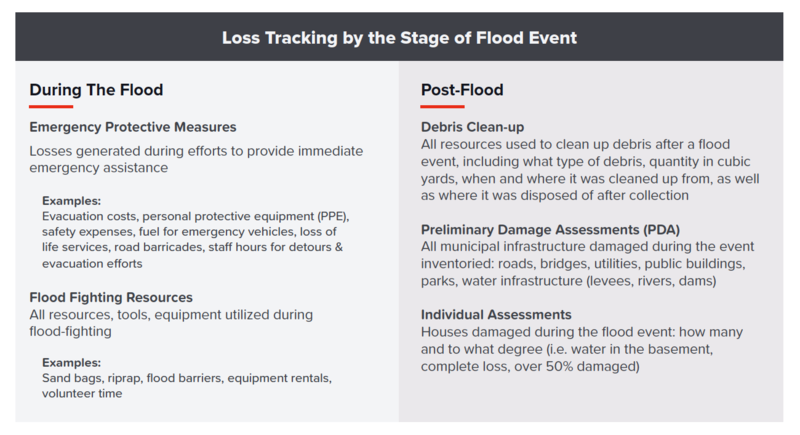 To receive the maximum funding available, communities must work to track and document all losses accrued during a disaster; a process that can be tedious and a bit overwhelming. To help you begin the process, here are some of our top tips for tracking disaster losses during and after a flood event. If you have not already done so, your community will need to declare a state of emergency ASAP. This declaration activates special funding mechanisms created specifically for disaster relief. 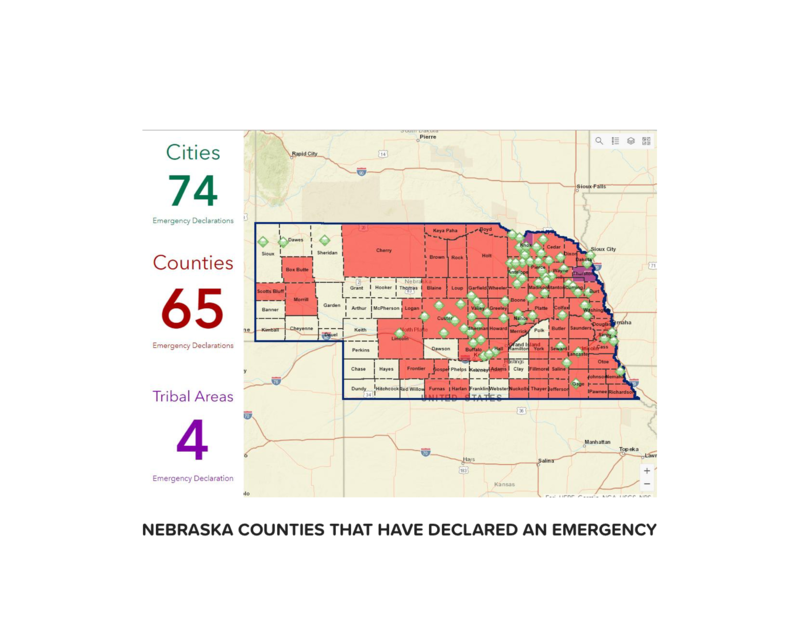 As of March 18, 2019, over half all counties in Nebraska and a large portion of Iowa have declared an emergency. Once flooding has subsided, you will need to provide FEMA with documentation as to what was damaged and to what extent. Rather than waiting for infrastructure field inspections post-flood, proactively capturing images and other documentation (labor hours, material) for damages during a flood event can give you a major leg-up when it comes time to begin reporting the entirety of damages associated with a flood event. Communicate with your staff as early as possible to capture images, videos, and notes about areas that have been damaged by flooding. In this case, a picture is truly worth a thousand words as pictures can help FEMA officials work to validate your community’s damage claims quickly. If you do not already have one, create a shared folder system for staff members and volunteers to upload and store all damages media in an organized fashion. This will save you a major headache down the road when trying to locate specific photos. Emergency Protective Measures accomplished within the first 72 hours of an emergency flood event can be almost completely recovered through FEMA and other disaster relief funding mechanisms. As such, it is in your best interest to create a list of all costs accrued as a result of the flood during this time. These costs can range from supplies and resources needed to fight flooding, to the administrative staffing costs for keeping track of the accumulated damages from the event. To get started tracking your losses, use the FEMA Finance sheet. Rather than tracking disaster losses for a flood event as a whole, we recommend tracking them in the order in which they were incurred. This will help your team paint a more detailed picture of total losses associated with the event and provide a solid starting point to begin the work. For flood events, this means starting with the losses associated with providing emergency protective measures first, as they would be the first expenses incurred in the event. By nature, communities seek disaster relief assistance following high-stress emergency situations. There are many decisions to make, and not much time to make them. Although, your community likely has an emergency plan in place, don’t be afraid to reach out for help should you need it. Reaching out to clarify questions early will save your community from missing out on disaster relief funds in the future. 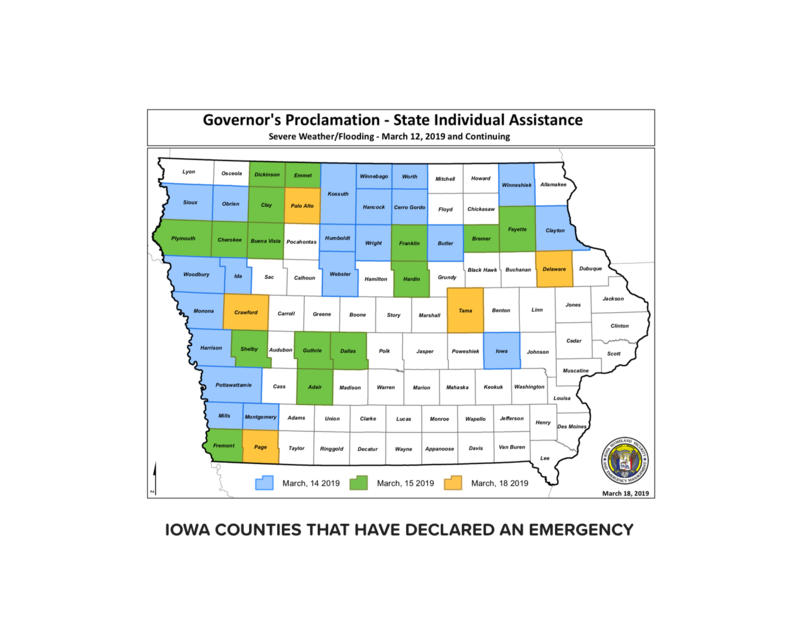 Every county has an emergency management professional assigned to assist communities through this disaster process. Reach out to them and the NEMA staff for direct assistance as you pave the way through the response and recovery process.